Michael Jackson performing at The World Music Awards in 1996. 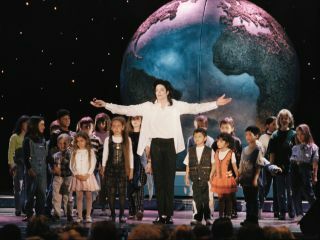 The 2010 Grammy Awards will feature the premiere of a "3D mini-movie" for Michael Jackson's Earth Song, it has been announced. This will be shown as part of a tribute segment to the star that will feature Celine Dion, Jennifer Hudson, Smokey Robinson, Carrie Underwood and Usher. Although The King Of Pop isn't actually seen in it, The 3D film was originally intended to be used during Jackson's This Is It residency in London last year. "It was one of the most important portions of the concert tour to Michael and when Michael saw the film for the first time at his last rehearsal, there were tears in his eyes," said Grammy co-Executive Producer Ken Ehrlich. A section of the Earth Song footage was included in the This Is It documentary that was released in 2009, but the Grammy showing will be its first full public airing. It's also been revealed that US retailer Target will be giving away millions of pairs of 3D glasses next week so that TV viewers at home can experience the film as intended. These glasses will also be given to the audience inside the Staples Center (the Grammy venue). There's a bit of history with Earth Song and awards shows, of course: when Jackson performed it at the 1996 Brits, the stage was invaded by Pulp frontman Jarvis Cocker. The Grammys take place on Sunday 31 January.